FREE Water Line Repair Estimates! Pulling your refrigerator out may see like an easy enough task, but many fail to realize the damage it could cause if not carefully put back in place. For homes that have a PVC pipe attached to their fridge’s waterline, a small bend in the plastic can cause the line to break. This can lead to a major leak, which homeowners may not be aware of, causing serious water damage issues. Though PVC pipes help cut back on costs, copper water lines will save you thousand on insurance repair fees. 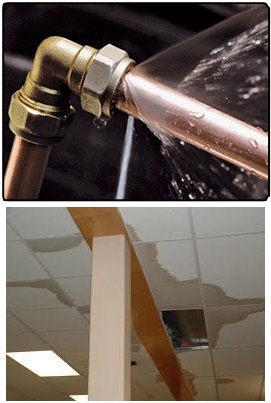 By installing copper water line pipes, this greatly reduces the water damage that could arise. Moreover, copper pipes add additional benefits as they last longer and are more durable than plastic piping. Additionally, they are fire resistant and bacteria cannot grow on them. The best part is they are installed very inexpensively. As Southeast Michigan’s leading water damage and water line repair servicer, we are here to help. Our trained professionals are I.I.C.R.C. certified and follow all of the correct procedures. We specialize in detecting and removing unwanted moisture from your soaked hardwood and tile floors as well as your belongings. Our team will respond 24 hours a day, 7 days a week and is typically onsite within 1 hour of your call. To better serve you, we work with all insurance carriers. Get A Water Line Repair Estimate, Fast.